Kensington, Brooklyn: NONE SHALL PASS! 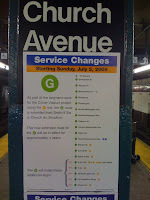 While such things have been rumored for years, starting tomorrow those pesky G trains will no longer pass us by on their way to hipper places. Click the image for the details, if you haven't seen these posted already. Thanks to everyone who sent this in. Even more thanks to those of you who notice when we end sentences in prepositions, but don't bother to complain about it.